The first year free offer on the BMO World Elite MasterCard has been extended to May 31, 15. That will save you $150 and get you $300 in instant travel credits plus 4 lounge passes. Find out more or apply for the card here. "Hilton is still an MR partner, but because of some technical issues, it’s not appearing on the site. The team is looking into it and it should be fixed shortly. That said, all redemptions and transfers are still working if Cardmembers call in." 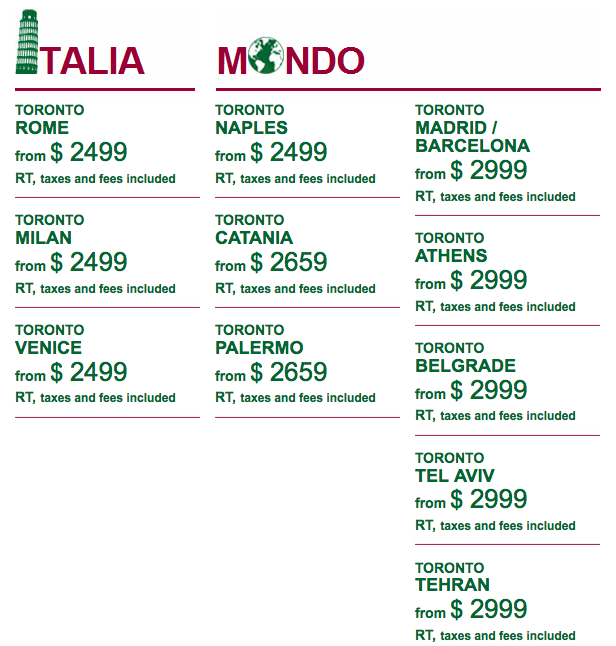 Alitalia has matched their partner airlines, Air France & KLM with a business class from Canada to Europe. Fares are as low as $2499 all in for summer travel! Book by Apr 29 for travel May 1 - Aug 31, 15.Find out more here. - 500 Bonus Rewards points for stays at the BEST WESTERN Hotel Restaurant Fidder Zwolle. More... Until ?